Dr. Bert is an Assistant Professor in the cornea division at the Doheny Eye Center UCLA. He is an honors graduate of both UCLA (2004 - BS Physiological Sciences) and SUNY Upstate Medical University (2008 - MD). He completed his internship in internal medicine (2009) at the St. Luke’s-Roosevelt Hospital Center, the University Hospital for Columbia University in Manhattan, where he was named the outstanding preliminary intern. Dr. Bert then completed his ophthalmology residency at the prestigious New York Eye and Ear Infirmary (2012), where he was unanimously elected chief resident by the faculty, staff and residents. At the end of his training he received the award for most outstanding resident. During residency, Dr. Bert was already interested in refractive surgery and performed enough surgeries to satisfy the stringent requirements for certification on the most common laser (LASIK and PRK) platforms of the time. Dr. Bert went on to complete a cornea and external disease fellowship at the Doheny Eye Institute, then at USC (2013). As part of his fellowship, he also trained in the care of pediatric cornea and external disease at the Children's Hospital of Los Angeles (CHLA). 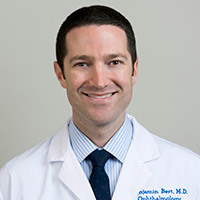 After three years in private practice with his father and receiving teaching awards from the residency programs at both UCSF and the California Pacific Medical Center, Dr. Bert returned to become a faculty member in the now partnered Doheny and Stein Eye Institutes at the David Geffen School of Medicine, UCLA. Dr. Bert’s practice includes caring for complex refractive patients while using the most current technologies. This includes toric and EDOF/multifocal intraocular lenses, intraoperative aberrometry, LASIK and PRK. He also cares for complex corneal disorders with both medical and surgical management; including, corneal collagen crosslinking, PKP, DALK, DSAEK and surgeries for the ocular surface. Dr. Bert’s office telephone number is (714) 963-1444. Dr. Bert performing a PRK surface ablation procedure with ophthalmic technician's assistance.